Space shuttle Atlantis moving on the Orbiter Transporter System (OTS) at NASA's Kennedy Space Center in Florida. The same OTS will be used to deliver Atlantis to the Kennedy Space Center Visitor Complex on Nov. 2, 2012. The last of NASA's space shuttles to move into a museum will roll over to its Florida retirement home in one week's time. Next Friday (Nov. 2), space shuttle Atlantis will leave the Kennedy Space Center (KSC), where it launched to space 33 times, to land at the KSC Visitor Complex located just down the road. It won't be the longest trip the shuttle has made, or even the most memorable, but as the last trip of its kind, it will be making history. "It's only a priceless artifact driving 9.8 miles and weighing about 154,000 pounds," Tim Macy, the director of project development and construction for Delaware North Parks & Resorts, which operates the visitor complex for NASA, said on Thursday (Oct. 25). "We've been planning for this a long, long time." That planning, which will result in about 350 people being needed on the day of the move, has included scouting the roundabout route that space shuttle Atlantis will follow, building a full scale mockup of the rig that will hoist the orbiter almost 40 feet into the air and then tilt it 40 degrees to one side, and scheduling stops where both space program workers and several thousand ticketed public spectators will get a chance to see the orbiter along the way. The move will come just three days after Atlantis' sister shuttle, Endeavour, will open on display at the California Science Center on Oct. 30. 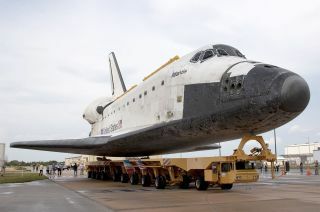 Atlantis' delivery will be much more straight forward than Endeavour's 12-mile, three day roll through the streets of Los Angeles earlier this month. Atlantis' final journey will begin at about 6 a.m. EDT (1000 GMT) on Nov. 2 when it backs out of its current parking spot inside Kennedy Space Center's 52-story tall Vehicle Assembly Building (VAB). This last launch, although not to space, still carries some weather constraints, which will need to be cleared before Atlantis hits the road for the visitor complex. "Because it is such a long window, once we commit at 7 a.m. in the morning, and are going south... we are go for the day," Macy explained during a call with reporters. "So we're working closely with the 45th Air Wing and the same meteorologists who worked on the launches who will help us with the criteria." "If it's not squally or intense rain, then we're in pretty good shape to move," he said. Assuming good weather, Atlantis will leave the VAB riding atop a 76-wheel vehicle that was designed specifically for moving the space shuttles between facilities. It previously carried the orbiters between their processing hangars and the VAB as the shuttles moved closer to lifting off. "The orbiter rides on what we call the OTS — the Orbiter Transporter System — which is the 'Ferrari' of the OTS family. It moves at the breakneck speed of about 2 miles per hour, so we have to cover the 9.8 miles in that time," Macy said. Not that there aren't benefits to being on government land. "We're going to take it down a route that most of it, I'd say 70 percent of it, will be behind the fences as it were, in terms of it won't be on public grounds but it will be on the KSC property," said Macy. "The good news is that it is on KSC property, the roads are wide and the property is an industrial kind of area, so it is really set for this kind of movement." Bill Moore, COO of the Kennedy Space Center Visitor Complex; Janet Petro, Deputy Director, of NASA's Kennedy Space Center; Lieutenant Governor of the State of Florida Jennifer Carroll; Jeremy Jacobs, Chairman and CEO, Delaware North Companies; and astronaut Chris Ferguson, commander of the final flight of space shuttle Atlantis, break ground Wednesday, Jan. 18, 2012 for a $100 million, 65,000 square foot exhibit dedicated to the retired shuttle at NASA's Kennedy Space Center Visitor Complex in Florida. The clearest, and therefore chosen, route will first take Atlantis away from its destination before looping around to avoid any structures along the way. As a bonus, it will take the orbiter past KSC's headquarters building, where a morning ceremony for space program workers is planned. It will also deliver Atlantis to a still under construction light industrial park called Exploration Park, where the bused-in public will get a chance to walk around the shuttle. Even the roundabout route however, wasn't without some obstacles. Along the 9.8 miles Atlantis will travel, 120 light poles, 23 traffic signals, 66 traffic signs and a power line needed to be temporarily removed. "We have some logistics we're handling, but actually it's really manageable," Macy said. "There are a couple of tight turns right as we get into Exploration Park and we have had to trim back some scrub pines [trees] but that's about it." Macy bases his confidence in the route on a trial run with the transporter, with poles standing in for Atlantis' 78-foot (24 meter) wingspan. "We have run the route, actually taken the OTS along the whole route except for the last mile or so, so we are comfortable that it works and there are no real issues," Macy said. "We took it around the route with 80-foot poles — 40 feet on each side — so we're pretty comfortable with it." Should all go as Macy and his team have planned, Atlantis will pull up to the visitor complex by 6 p.m. EDT (2200 GMT), where a celebratory fireworks display will await its arrival. But even though its journey is over, the work to display Atlantis will be just beginning. Arriving at its $100 million new home, Atlantis, still atop of the OTS, will roll right inside. "It's more like a carport right now. It's like a garage without the door," Macy described. "As soon as we get it in, we start filling in behind it. We work that simultaneously with getting Atlantis ready to be lifted in place." That's right, Atlantis' next motion will be up. The six-story display facility was designed to showcase the shuttle as only the astronauts have had a chance to see it. "If you were in the International Space Station and looked out the window, what would the orbiter look like when it was about 150 yards away from you?" Macy said, citing the original idea that helped shape Atlantis' display plan. "The [payload bay] doors are still open, the [high-gain, S-band] antenna is out, and in this case, we'll have the Canadarm [robotic arm] out as well." To achieve the intended appearance, Atlantis needs to be lifted 36 feet (11 meters) into the air and then tilted 43.21 degrees. "When the guests come to see the orbiter, their feet will be basically at the same height as the open payload bay doors," Macy explained. "So they'll be able to look into the open bay on the orbiter. And then further, they'll go down a ramp and be able to walk around the orbiter and see the tiles up close." While the work to erect the fourth wall to seal Atlantis in the building will take until mid-December to complete, the shuttle's lift will get underway by Nov. 11 and take a few days to accomplish. First, Atlantis' landing gear will be lowered and the OTS will be driven out. After about a week on its wheels, steel support beams and jacks will be used to hoist the shuttle about 12 feet high (3.7 m) so its gear can be stowed again and a loose shrink wrap of sorts can be applied to protect the orbiter from dust. Then, larger jacks will be used to raise Atlantis the rest of the way, before one side is slowly lowered to achieve the desired angle. To make sure that setup would work, Macy and his team practiced first with a 155,000-pound (70,300 kg) stand-in. "We have actually built a full-scale mockup of how we are going to lift the orbiter and put it in place," he said. "It took us about five weeks to set it up and get it going. But we lifted it the full 36 feet in the air and turned the payload mock-up 43.21 degrees. So, we are happy with how that works." "Opening the payload bay doors from an engineering point of view, is just about as complicated as raising [Atlantis] up," said Macy, adding the process involves roof-mounted dollies and cables but is difficult to describe. Ultimately, some 60 other related exhibits will be moved in to surround Atlantis, so when the building opens to the public in July 2013 there will be something for everyone. Among the displays will be a full size Hubble Space Telescope model, space shuttle landing simulators and an interactive wall where mission details can be retrieved at the touch of a finger. But before any of that can happen, Atlantis first needs to complete its final journey, set for next Friday. "I think there'll be a huge sigh of relief," Macy said. "When it gets in Friday night and lands where it is supposed to and we turn the key [to the OTS] off. I think that is going to be a huge emotional kind of 'phew' moment."